This package contains a node to provide hardware_interface::PositionJointInterface, which simply loopback the command joint position to the actual position. In other words, it is faking a perfect joint controller. It can be used from ros_controllers such as JointTrajectoryController. You can check your own joint trajectories on rviz, without using Gazebo or others. Add robot model to see the robot. Choose Plugins->Robot tools->Joint trajectory controller to load the plugin. Select controller manager and controller, then you can see sliders to set the joint trajectory goals. When it is true, the driver read the parameter /robot_description to obtain the joint list to control by this driver. When it is false, you must specify the joint list by include_joints parameters. This is the list of the joints which the driver node should control. This is the list of the joints which the driver node should not control. This is a map to specify the initial position of the joint. You can use this to avoid collision in zero joint angle. 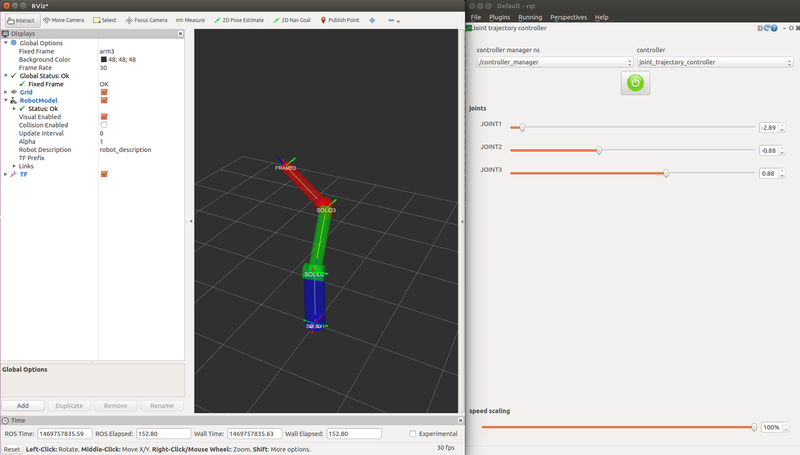 You can set target joints for joint_trajectory_controller in the config/controllers.yaml. Note somehow you cannot see any controllers and joints in rqt_joint_trajectory_controller if any joints have no joint position limits in URDF file. It is easy to be trapped.